When did Challenge become a four letter word? I’ve encountered a lot of people who do not like a challenge. Instead of accepting something will be hard and challenging, they shy away. Not only is it frustrating, but I am generally surprised at some of the people who stay in their comfort zone. I work with the military and I run into some of the toughest people out there, Navy Seals, EOD, Marines, Special Forces. And these guys (sorry for being gender specific but most of them are guys) are tough, can manage to out PT the average person, and have seen things most people will never see, but most tend to stick with what they are good at and comfortable with. They accept challenges, but challenges they already know. They tend to like physical challenges- no problem, no worries. And yes that is great. But when faced with other challenges, many of these guys shy away, get combative, and suggest we go to the gym because that is the only important thing out there. And that is frustrating. People don’t grow when things are easy, they grow and find out who they are when things are tough, when things are hard, and when they are challenging. Right now I am facing my own challenges. None of these are easy. I guess I can either look at these as obstacles or see these as opportunities. My torn meniscus gives me the opportunity to do yoga again and try crossfit. A new project at work gives me the opportunity to see how we can improve Navy professional military education. Am I terrified that I might fail? Yes, actually I accept I will fail, because when I fail I learned the wrong way of doing something. 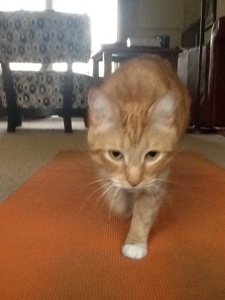 And a bonus, my new challenges let me spend time with my new yoga buddy.